Greeneview senior Collin Wilson soars over the Greenon defense for a layup that ignites the home crowd early in the first quarter, Feb. 12 in Jamestown. 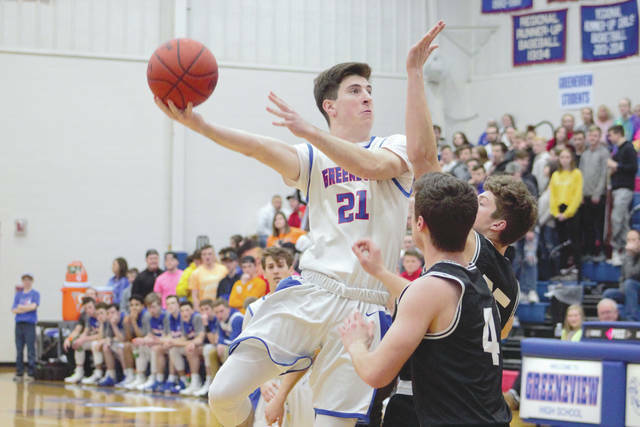 Greeneview senior Ian Tamplin sets to drive the baseline, in Tuesday’s Feb. 12 Ohio Heritage Conference boys high school basketball game with visiting Greenon. 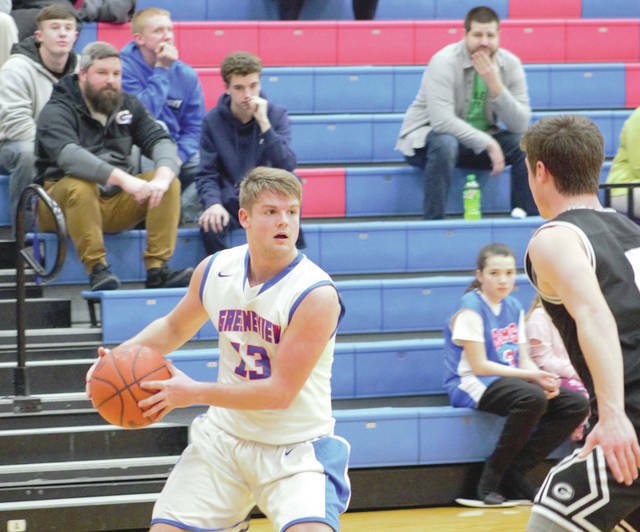 JAMESTOWN—The Greeneview Rams simply could not buy a shot against their divisional opponent, the Greenon Knights. Groans could be heard from the Rams fans with each passing possession that resulted in a missed shot. This feeling was even more pronounced in the second half as the Rams didn’t score in the third quarter until there was 3:40 left. The team’s inefficiency ultimately left the Rams with a loss by a score of 47-32. The Rams (7-13 overall, 5-9 in the Ohio Heritage Conference South) played aggressively on the boards with some offensive possessions resulting in three, four, or even five shots. However, many times the team would have to turn back to defense without a bucket anyway. Greeneview senior Collin Wilson led the Rams with 13 points. Greenon’s Cade Rice led all scorers with 19. The Knights (9-11, 7-7 OHC South) head to London to take on Madison-Plains on Friday. Fulk said the Rams discussed what went wrong for them in the locker room and they will be looking to adjust going forward. He said the team was united together and his seniors were going to be the ones leading the way going forward for the remainder of the season. “We are trying to build momentum for the tournament with these final two games in the conference,” Fulk said. “These are some great kids and we have at least three games left together, so I’m excited to see what we can do. Greeneview will next play at 7:30 p.m., Thursday, Feb. 14 at Catholic Central. https://www.fairborndailyherald.com/wp-content/uploads/sites/50/2019/02/web1_IMG_2087_PS.jpgGreeneview senior Collin Wilson soars over the Greenon defense for a layup that ignites the home crowd early in the first quarter, Feb. 12 in Jamestown. https://www.fairborndailyherald.com/wp-content/uploads/sites/50/2019/02/web1_IMG_2120_PS.jpgGreeneview senior Ian Tamplin sets to drive the baseline, in Tuesday’s Feb. 12 Ohio Heritage Conference boys high school basketball game with visiting Greenon.